On Tuesday 7 May 2013 Faber held the second of their Faber Crime Social Evenings at The Social, a club along Little Portland Street in London. 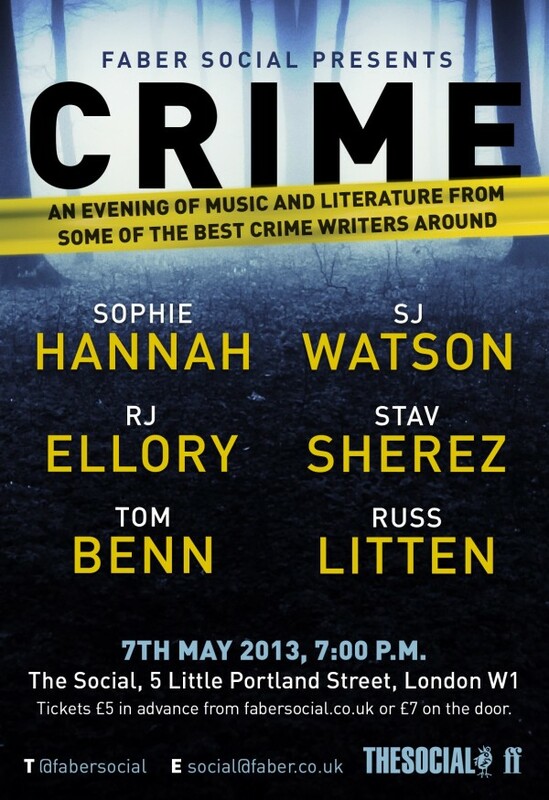 On the bill were a number of crime writers (not solely from Faber) who were planning on reading from their work. First out of the starting block was Faber author Stav Sherez who read from his latest book Eleven Days. Eleven Days is due out on Thursday 9 May 2013. Stav's previous book Dark Redemption has just been long listed for the Theakston's Old Peculair Crime Novel of the Year. Stav was followed by R J Ellory who read from his work in progress. Tom Benn took up the mantle after Roger Ellory and read from his lastest novel Chamber Music. In a brief clip below you can hear Tom Benn reading from his novel. After a brief break Sophie Hannah read from her latest novel The Carrier and also from her work in progress. 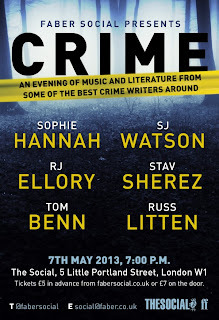 Sophie was followed by Russ Litten who read a gritty beating shop scene from Swear Down and it was rounded up by S J Watson reading from a one time only crime story based around the event taking place. The next event is due to take place on 3 June 2013.